Words cannot describe the sense of pride that AMPL felt Tuesday morning when you filled the Commissioners’ Chambers and people were starting to flow into the hallway and it was only 8:45 am. 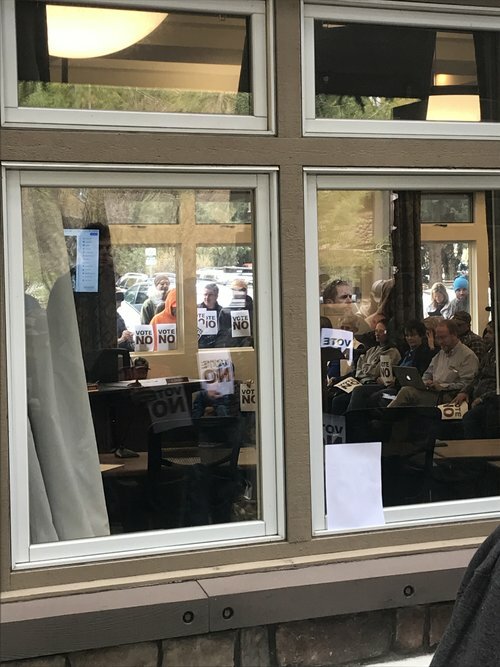 As 9:00 am approached I glanced out the windows and saw individuals coming from all directions towards the already packed County building in droves. You didn’t turn around and leave. No, you stood there looking in the window peacefully holding up your Vote No signs and listened to every comment being made. You didn’t boo when someone made a comment that was in favor of taking away our public lands access, instead you were respectful, and then one by one you started coming forward and talking about the lands we cherish and respect, and why access is so important to you and your family. It was incredible to see people young and old, from Teton County, Wyoming, Idaho and Alpine come out to support motorized and mechanized recreation. 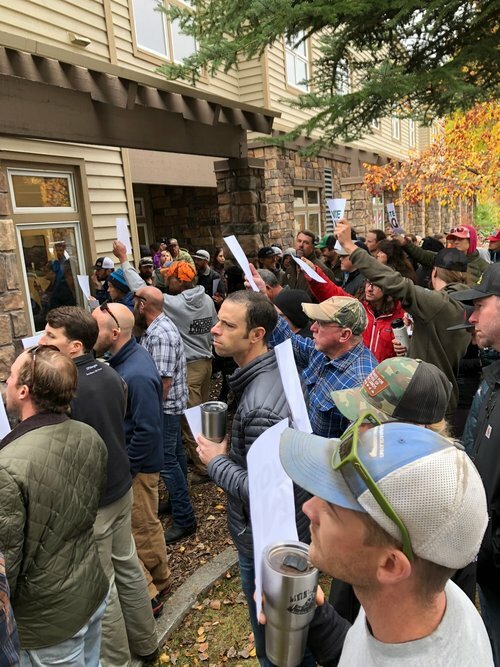 The Jackson Hole News and Guide story about the meeting estimated nearly 200 people in attendance! I feel confident that we represented at least 165+ of attendees based on running out of the 150 Vote No signs we brought and passed out. The News and Guide story does a good job explaining the Commissioners discussions, and by your showing up in force we made headline news for our cause to keep recreational access intact. I sat on the edge of my seat in the front row and listened to the entire 3.5 hour meeting. I believe the Commissioners really heard your thoughts and concerns. I also feel as if though they are starting to realize the implications of trying to pass a proposal which isn’t supported from all stakeholders represented on the WPLI committee. With all this being said we are close, but haven’t quite crossed the finish line. We’ve got one more week until the final decision is made. Because of the sheer volume of public comment on Tuesday the Commissioners had to push their final vote until next Tuesday, October 16th (the exact time to come following the release of the BCC agenda). I know it’s asking a lot of you to show up again, but YOU are the difference! Your passion for these lands and protecting your access is what hopefully will finally stop the largest potential loss of access in 34 years in our backyard! See you next week!